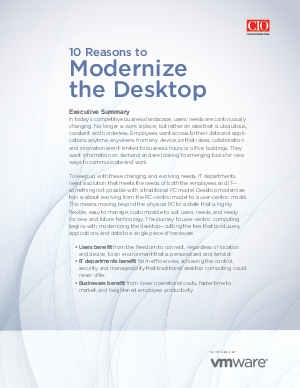 Desktop moderniza-tion is about evolving from the PC-centric model to a user-centric model. This means moving beyond the physical PC to a state that is highly flexible, easy to manage, customizable to suit users’ needs, and ready for new and future technology. The journey to user-centric computing begins with modernizing the desktop—cutting the ties that bind users, applications and data to a single piece of hardware.